← Off to Barcelona and one kilo down! It’s about 1°C and I’m taking the metro to meet friends for lunch. 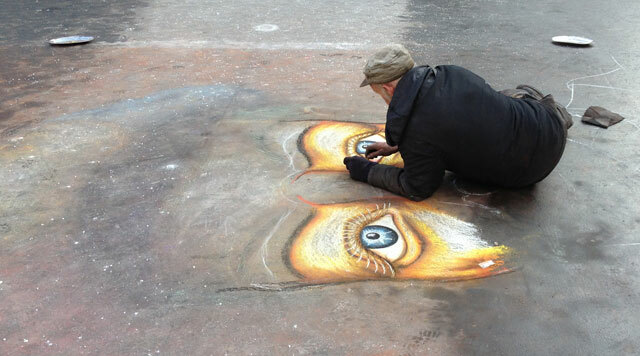 As I walk through Palais Royal, I see that one of our regular pavement artists has begun work. I’m cold just looking at him. On the metro reading, I open up Jane Austen’s “Sense and Sensibility” which I’m reading again. The French lady next to me asks if I’m happy with my Kindle. “Oh, yes, I love it!” “My husband bought me one for Christmas but it hasn’t arrived yet”, she says. I then proceed to tell her about my favourite features: you can increase or decrease the size of the characters which is wonderful when your sight diminishes and you can download an extract of a book before you buy it. 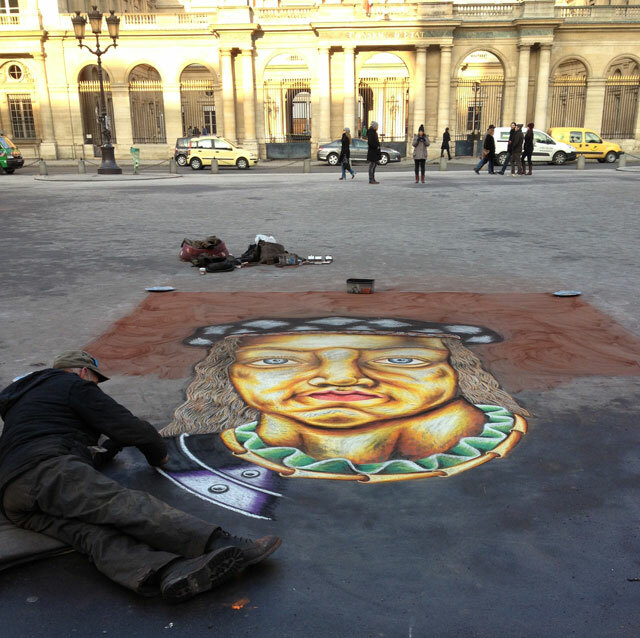 Pavement artist on Place du Palais Royal at 1°C. As I mentioned in a previous post about Kindles, I’m one of those people who can’t survive without reading. I hear many book lovers say they have to have the physical object but I must confess that that I’ve now been reading on my Kindle non-stop for nearly 10 months and I don’t miss paper books one little bit! My preferred place to read is in bed and some paperbacks are just too big to read comfortably. If you’re eating breakfast alone, you can prop your Kindle up in front of you. It fits easily into your handbag when you take the metro. If you’re going on holidays, you don’t have to find room for several heavy books and with the 3G version, you can download a new book anywhere! When you’ve finished one book by an author, you can then proceed to read all their other works. I’ve nearly finished the complete collection of Jane Austen, which I’ve never been able to do before. It’s a great space saver of course and extremely environment-friendly. I unfortunately don’t have the back-lit version but I now have a little light that I can clip on so I can read when Relationnel’s asleep – a big boon for an insomniac like me. Some people use their iPads to read, but I find it’s too heavy and the light isn’t comfortable for reading. The Kindle is just perfect. Another thing is that you don’t have to keep track of a bookmark. It always opens at the right place. The only thing I don’t like is that it’s a bit tricky to flip back to check on something you’ve already read though maybe there is a trick to it that I don’t know. Kindle books are much cheaper than paper ones and you can get most classics free. I was amused to see that the only novel by Austen that is not free is “Sense and Sensibility” but it costs less than a euro. I love it when someone talks about a book and I can immediately download the extract and see if I like it. There is also a “share” function that I haven’t explored yet. So with all these wonderful possibilities, what have I been reading apart from Jane Austen that I can recommend? I’ll let you check them out on Amazon as book reviews are not really my thing. The Light Between Oceans by M.L. Stedman, which I really enjoyed, though it’s pretty tough. It tells the story of a returned soldier in Australia who went to live in a lighthouse. I chose this book after reading an excellent review on a blog called Word by Word. The Blindfold by Siri Hustvedt who is one of my favourite writers and did not disappoint me. Its about a poor young graduate student struggling to find an identity. A Month in the Country by J. Carr which combines the return of a WWI veteran with mediaeval church restoration. Unaccustomed Earth by Jhumpa Lahiri, an Indian writer living in the US. It’s a collection of short stories whose main theme is the clashes of culture. The Summer Without Men by Siri Hustvedt, whose main character is a mature woman whose husband decides he needs a « pause » in their marriage. The Secret River by Kate Grenville who follows the lives of a family of convicts and first settlers in Australia and there relationship with the aborigines. Sarah Thornhill by Kate Grenville, the sequel to the previous book. Paris: A Love Story by Kati Marton, my favourite in 2012: the autobiography of a Hungarian woman who married two famous men, the ABC anchor Peter Jennings and the diplomat Richard Holbrooke. Lone Wolf by Jodi Picoult, which is a bit strange but readable nevertheless. It explores a man’s relationship with wolves and how it affects his family. This entry was posted in Art, Lifestyle, Paris and tagged kindle, paris pavement art, place du Palais Royal, word by word. Bookmark the permalink. I love Kate Grenville. When The Idea of Perfection won the Orange I bought a copies for my boss and several of my friends. It was so nostalgic for me — like it was written about the town I grew up in, and at the same time talking about issues of heritage conservation that concerned us at work. I’d like a Kindle, but Simon doesn’t approve of the fact that you don’t own the books. I’ve downloaded The Idea of Perfection, which I haven’t read. It’s a pity Simon doesn’t like the fact that you don’t own the books. But he can own his! My Kindle Paperwhite is arriving in the mail any day now (finally!!). We ordered it mid-December. My husband and I are going to share it because there isn’t much choice in the way of French books (or they are more expensive than paperback) so it’s going to be mostly for English books. I think I will end up using it the most. If I do hog it too much then I guess we’ll buy another one for him. I can’t wait to use it! I find it uncomfortable holding up a book in bed and now that I’m having trouble sleeping again, I’d like to be able to read myself back to sleep without disturbing my husband. The Paperwhite has a backlight so that should be great! And I am looking forward to being able to set the font size to something more readable than some of the paperbacks I’ve read recently.